As traditionally, plenary talks are held on Mondays, Tuesdays and Wednesdays at EAMTA. Dr. Galo Soler Illia (INS, UNSAM) was born in Buenos Aires in 1970. He studied Bachelor’s and Ph.D. in Chemistry at the Faculty of Exact and Natural Sciences (UBA) between 1989 and 1998. He did postdoctoral studies in nanomaterials at the University of Paris VI. He returned to the country in 2003 and founded the Chemistry of Nanomaterials group at the CNEA, which currently employs about 20 researchers and fellows. 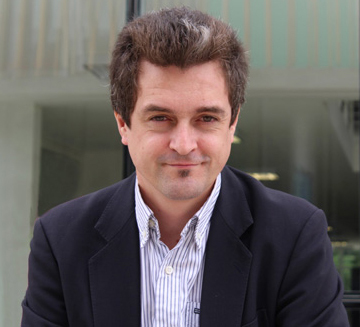 He is Principal Investigator of CONICET, Adjunct Professor at DQIAyQF (FCEN, UBA) and has been a Guest Professor at the Universities of Paris VI and Melbourne. It is dedicated to designing and producing new nanosystems with intelligent architectures and customized properties, using chemical methods inspired by Nature. He has published a hundred scientific articles, trained human resources, and obtained several awards in chemistry, physicochemistry and nanotechnology. It maintains collaborative projects with national, foreign laboratories, and with industry. He makes scientific dissemination on television and has published 2 books on the subject. Author of more than 120 scientific publications (+6500 citations), one international and two national patents. He has obtained national and international subsidies, and the Venancio Deloufeu awards 2006 (ANCEFN), Bernardo Houssay 2006 (SECyT) for young researchers and The 2009 Houssay Award from MINCyT in the area of ​​Chemistry, Biochemistry and Molecular Biology. Advisor of assistant researchers, 7 finished PhD thesis, 5 ongoing, 3 ongoing postdoctoral fellows. In 2015, he founded and direct the Instituto de Nanosistemas, Universidad Nacional de General San Martín. Abstract. Materials exhibit an unusual behavior when their size is on the nanometer scale, due to changes in their electronic structure, the huge surface-volume relationship and the confinement of matter. At the nanoscale the quantum behavior of matter and its molecular nature are revealed. Today a huge variety of nanomaterials with custom properties is known, which is possible to produce from the techniques of molecular chemistry, supramolecular and materials. In this talk, I will show examples of how complex nanosystems, composed of several different types of nanomaterials, can be designed from building blocks and assembly principles using nanoscale forces. These nanosystems are capable of generating signals or responding to external stimuli, and can also integrate and connect to the most common platforms of optics and electronics, opening the possibilities to new intelligent devices. Dr. Ing. Nicolas Nemirovsky (ITBA) obtained his Professional Doctorate in Engineering at the Technische Universiteit Eindhoven (Netherlands) in 2011 and his Electronic Engineering degree at the Technological Institute of Buenos Aires (ITBA) in 2008, having obtained a merit-based scholarship and winning the prize for best Final Studies Project. Since 2016 he is Director of a Research Group on Smart Grids related with Renewable Energies in ITBA. He is Project Manager at the consulting department of the University towards the private and public sector, in miscellaneous topics related to Energy and Electronics Engineering. He worked in ASML between 2011 and 2015. During his first year he worked as Test Engineer in the EUV (Extreme Ultraviolet) Illuminator Electronics. Between the years 2012 and 2015 he was Head of Technical Projects in the development of EUV sources for last generation lithographic machines. Among the different tasks carried out during this time are the work on the design of the safety architecture of the full laser system and the electronic architectures for the Final Focus Assembly, Timing and Energy Control and the tin Droplet Generator Steering System. In university teaching, he is, since 2015, professor with exclusive dedication in the Electronic Materials Technology and Discrete Control courses and is one of the thesis advisers in Final Studies Projects. Since 2016 he has also been a guest speaker in the Alternative Energies course and participates in Training for Entrepreneurs (subject for all engineering degrees) and Communication for Engineering (admission course for all Engineering tracks). Abstract. Moore’s Law tells us that the number of transistors in an integrated circuit doubles every two years. It is used by consumers as an indication on how much smaller, faster, better electronics will be in the future. However, in the semiconductor industry, Moore’s Law is what sets the industry a target, what drives it. In the heart of miniaturization lies lithography, since it drives some key parameters: imaging, which indicates how small a feature can be created, and overlay, which says how well can two layers of features be positioned with respect to one another. Today, each nanometer increase in resolution and precision is only possible with significant efforts from multidisciplinary teams, and an ever-increasing investment in R&D. This can be clearly seen in Extreme UltraViolet (EUV) lithography technology, which is enabling the next semiconductor nodes, effectively prolonging Moore’s laws for the coming years. These machines create EUV light by bombarding tiny droplets of tin with a high-power infrared laser with enough power to create a tin-plasma bubble, within an ultra-clean high vacuum consisting of an extremely low pressure of hydrogen. Many aspects of this technology are, in themselves, a technological breakthrough: from being able to create dozens of thousands of micrometer-wide tin droplets in one second, to being able to focus, fire and hit those droplets twice, in mid-flight, with one of the most power lasers in the world. This is an exemplary case-study where science and technology meet engineering to deliver the next step in semiconductor manufacturing. Ing. Victor Grimblatt (Synopsys, Inc.) has an engineering diploma in microelectronics from Institut Nationale Polytechnique de Grenoble (INPG – France) and an electronic engineering diploma from Universidad Tecnica Federico Santa Maria (Chile). He is currently R&D Group Director and General Manager of Synopsys Chile, leader in Electronic Design Automation (EDA). He opened the Synopsys Chile R&D Center in 2006. He has expertise and knowledge in business and technology and understands very well the trends of the electronic industry; therefore he is often consulted for new technological business development. Abstract. Last year, in Seoul, a computer program called AlphaGo defeated 9 dan, and 18 times Go world champion Lee Se-dol by a score of 4-1. This year, in Barcelona, SoftBank Founder & CEO, Masayashi Son, in his MWC17 keynote predicted that by 2045 computers made with chips integrating 3 quadrillion transistors, will have a 10,000 IQ. Artificial intelligence is changing the rules of the game: new computing architectures are emerging that lead to new classes of processors in the cloud, as well as in the “things” aimed at revolutionizing our life: robotics, cars, homes, phones, “every thing” gets smarter. It is hard to overstate the promises and the challenges we are facing in the new applications emerging in the age of smarter “every thing”. Moore’s law continues, quasi-relentlessly to enable exponentially larger chips manufactured using Angstrom-level process technologies, thus requiring smarter IC design tools; artificial intelligence may have an impact also on EDA, where the sheer complexity, which is approaching the limits of “plain” computation, could be addressed by “teaching” a “brain” how to solve certain classes of problems. Beyond Moore, better, tighter, smarter “integration” of processors and memory, delivering much higher bandwidth, enables new classes of processors – such as TPU – exponentially more parallel in architecture, thus enabling faster “machine learning”. On the one hand, AI may help EDA leapfrog the sheer complexity of Angstrom-level process technologies; on the other hand, innovative EDA may help AI happen. Our entire industry is under pressure to de-risk and speed-up the critical intersections. Smartness is “every thing”! This entry was posted on Viernes, Enero 27th, 2017 at 15:29 and is filed under EAMTA 2017. You can follow any responses to this entry through the RSS 2.0 feed. Both comments and pings are currently closed.